Jaguarundis do not look like little jaguars - they have small heads with small low set ears, a long flat tail, and a long low set body. They're one of the only solid colored wild cats. They have solid colored ears, which is unusual - most wild cats have a white or black spot on the back of their ears. Also called the Otter Cat, the jaguarundi is an unusual weasel-like feline that is found in the central America and as far south as Paraguay. A few still survive in southern Arizona and Texas. A United States endangered species, these cats are overall listed as Least Concern. 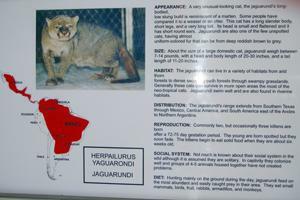 They are more active in daylight hours than most other wild cat species. They have seldom been studied in the wild.